Young students will love learning to count, compare, add, and subtract with these fun and colorful foam number balls. Use our suggested games to practice counting, greater than/less than, number bonds, and early addition and subtraction. 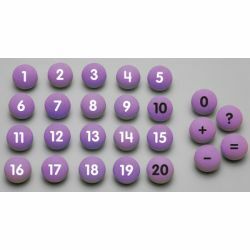 Set includes 21 numbered balls (0-20), 4 operator balls (+, –, =, ? ), and a variety of activity ideas.